MOSCOW, May 17. /TASS/. 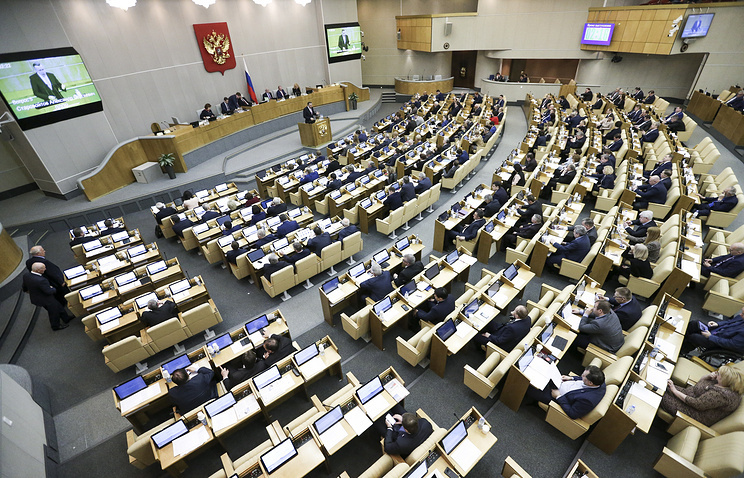 Russia’s State Duma on Thursday adopted in the second reading a bill on counter-sanctions. It is expected that the final, third reading will take place on May 22. The bill, proposed by a group of lower house members and State Duma Speaker Vyacheslav Volodin, envisages the possibility of counter-sanctions in retaliation for unfriendly measures against Russia taken by the United States and other countries. The government is empowered to introduce, on instructions from the president, a variety of counter-measures, which should not apply to essential goods not manufactured in Russia or other countries. Such measures can be introduced by the president on the basis of proposals from the Security Council. The government can lift counter-sanctions as soon as the reason for them ceases to exist. "The purpose of this federal law is the protection of interests and security of Russia, its sovereignty and territorial integrity, and rights and freedoms of Russian citizens from unfriendly actions by the United States and other countries, including political and economic sanctions against Russia, Russian citizens or Russian legal entities, and from other actions posing a threat to the territorial integrity of Russia or aimed at Russia’s economic and political destabilization," the bill says. Before the second reading all mentions of specific industries, goods and services had been removed from the bill and the list of likely counter-measures reduced from 16 to six. Companies from the United States or other unfriendly countries will be prohibited from participation in public procurement contracts and privatization of public assets. The same ban will be in force for companies operating under such countries’ direct or indirect control or affiliated with them. The Cabinet of Ministers will have the right to terminate or suspend international cooperation with unfriendly countries, as well as organizations within their jurisdiction or controlled by such countries directly or indirectly or affiliated with them. The government will have the power to outlaw or restrict the import or export of products and raw materials to and from the United States and other unfriendly countries. The counter-sanctions will not apply to goods that may be brought into the country by Russian citizens or foreign nationals for private use. In case of its adoption the law will take effect as of the day of its official publication.